It is time for Novelicious founder, Kirsty Greenwood, and her debut novel, Yours Truly, to get the Feasting treatment. And what a perfect dish for a soggy, wet wintery day. Apple pie. Yum. The warming dash of whisky in the apple sauce is optional, but a real treat. Natalie Butterworth has a problem. She struggles to tell people what she really thinks, putting up instead with bad, bowling-ball haircuts and allowing people to run her life and organise her upcoming wedding for her. Then, one evening whilst out with her best friend, Meg, she is accidentally hypnotised by a man called The Amazing Brian. Consequently, she finds she can't lie anymore. She has to tell the truth – her real thoughts. And the truth is, well, rather funny. Except to her boyfriend, poor lad. But really, he shouldn't have asked. To get Natalie put right – it's pretty embaarassing telling the truth all the time – Natalie, Meg, and Natalie's sister, Dionne, find themselves in Little Trooley, a small village in Yorkshire. They are on the hunt for The Amazing Brian in the hope he can de-hypnotise Natalie, and she can go back to not telling the truth. Except he isn't there. His house is empty. So while they are waiting for him to return, they get to know the locals at the village pub. One of which is Morag Braithwaite, who has a wonderful old family recipe for apple pie. Of course, with all of the truth-telling going on, when Natalie tells Morag Braithwaite that her apple pie is totally scrumptious, we know it really has to be. I have to admit to being a little daunted by pie, despite the fact I grew up eating it almost every Sunday. In recent times, with an emphasis on the dreaded soggy bottom, it is easier to pick a pie up from the supermarket rather than risk that humiliation. But this has put me off, wrongly, for far too long and I decided that this was the week I'd get to grips with the good, old British favourite – soggy bottom or not. It'll still be homemade after all and it will taste so much nicer than a supermarket version, even if the juice of the apples has seeped into the pastry. Is the standard response from Harry Spencer whenever he is asked by friends whether he and wife Emily are ready to become parents. Then Emily drops the p-bomb (as Harry calls it) and suddenly Harry is a thirty-something father-to-be who is still craving a twenty-something lifestyle. As the couple negotiate pregnancy’s ups and downs, Harry struggles to adjust to their new life and finds himself contacting ex-girlfriend, Jamie, on Facebook. Initially, he just wants to see what she has been up to all these years, but soon enough he is tempted by the ghost of girlfriends past and risks throwing everything away. Harry must decide whether to accept his new responsibility or give into the lure of an adolescent fantasy. After finishing this book nearly a week ago I still have mixed feelings about it. I almost want to call it “Lad-Lit” because it is clearly much more geared towards a male reader. As a woman, I hope that my future boyfriend or husband never behaves like Harry. While he is likeable, funny and generally doesn’t take life too seriously, he is also immature and weak. At times I found myself unable to comprehend why he would make such reckless decisions when he professed to love his wife and had a new baby on the way. I felt infuriated that whilst his pregnant wife was tired and trying to adapt to the changes in her body, Harry was sending inappropriate messages to an ex. If you haven't already heard via the many channels through which I am attempting to get inside your brain, my ebook YOURS TRULY is out today! There's also a really fun giveaway contest going on all day on my facebook page. Via your tweets, messages, 'likes' and buying the book you are giving me a better launch day than I ever dreamed was possible. Thank you so very much. If you do buy the book I truly hope it makes you smile. That would be the best thing ever. I was sorting out old boxes of paper and schoolbooks the other day when I found a notepad full of stories I had written around the ages of eleven and twelve. The back pages were filled with potential character names (Evan, Logan, Crystal and Lila were the favourites) and the front pages with stories and illustrations of the characters. I wrote these stories for myself in between library trips when I had read most everything in the house - I was a commerical fiction nut back then too (Sweet Valley High, Judy Blume, Point Horror) and my older sister's classics (Black Beauty, The Secret Garden, Oliver Twist) didn't cut it. A girl moves house and finds a painting and hangs it up. The painting is creepy and things move. A girl gets a doll's house for birthday mum/dad buy it from weird shop. Everything that happens in doll's house happens in girl's house too. Clearly, I had been reading some Goosebumps at the time. I found another couple of stories - one was called The Girl Who Always Got Her Own Way. Check out the beginning, you will see I have always been a fan of the first paragraph bombshell. Since my announcement last week (which, by the way, was THE most awesome day for me, thanks to all of you for your lovely comments and tweets), a few of you have asked me about the book cover for Yours Truly. Because I made it myself I thought I'd tell you a bit about how the design came about. Please note that I am self-taught and absolutely not a professional. Proper designers probably work in a much less skewiff manner! There would be hints of pink and if I could sneak some green in there too, that'd be peachy. My book is clear romantic comedy/chicklit/whatever the kids are calling it these days and I wanted that to be apparent in my design. So I got to work using an image editing program called GIMP (like photoshop but free). Yes. The book was originally called The Irresistible Truths of Natalie Butterworth and I was going to call myself Ruby March. A bit better. There's a moon. I liked the moon. Who doesn't like a moon, frankly. And the fonts were much sharper. But it still didn't look professional. There was a whisk now too. (Where's Whisk?) Natalie Butterworth really wants to be a chef and I wanted to get that across. Were hard-to-spot flying utensils the way to do that? Probably not. But I'd paid for these little pictures of forks and whisks and really wanted to use them. In Which Novelicious Publishes A Book! Alright, the title is a little bit of a link-bait. 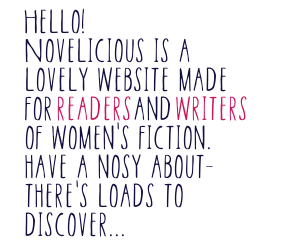 But if you swap 'Novelicious' for 'Novelicious Editor, Kirsty Greenwood' then it's about right! Some of you may (most of you probably don't) know that I recently had a book out on submission with publishers. What a rickety rollercoaster ride that was; I got dizzy, I was permanently excited, I cried, on occasion I puked. It was exhausting and exhilarating and icky and fun. Feedback was great - a couple of editors at big publishing houses loved the book, said amazing things about it and were interested in trying to sign it up. Edits were suggested and made and meetings were had, and for a little while my agent and I thought that the book-deal dream might be about to come true. But, alas, in the end it was not to be. So... here I am with a sparkly, funny book and what I think (I hope) is a gang of book-obsessed people (that's you guys, by the way) who will support me in putting it out there to compete with the big girls on Amazon. And when the time comes to submit my next book to publishers, it'd be so fab to have some kind of track record to show off. Your bum does not look big in that dress. Of course you’re better looking than Jon Hamm. Until one night, thanks to a pub hypnotist, Natalie’s most private thoughts begin to bubble up and pop out of her mouth. Things get very messy indeed. Especially when some sticky home truths offend her fiancé. Natalie must track down the hypnotist before the wedding is officially cancelled. So along with bad influence bestie Meg, Natalie finds herself in the Yorkshire Parish of Little Trooley - a small village bursting with big secrets, nosy old folk and intriguing Wellington-wearing men. It's going to publish as an ebook on the 4th of July and I'm nervous (and excited) as hell. I'll be popping up here on Wednesdays to tell you all about the journey up to launch day and how the book is doing. So, back to needing your help... I'm not going to ask you to buy the book; there's tons of great books to buy and I'm not going to be arrogant and suggest that you pick up mine over anyone else's (although I think if you are reading this site it would probably be your cup of tea!) but if you would be so kind to help me spread the word, I would be mega grateful. Truly. You could join me back here on Launch Day (Wednesday 4th July) where I'll be running giveaways (of my book and other people's books and probably some chocolates and other stuff) and getting steadily pissed on champagne (both real and virtual). And that's about it, I think!